Every day, Safran Electronics & Defense helps airlines, operators and Original Equipment Manufacturers by collecting, processing and analysing an increasing amount of flight data. 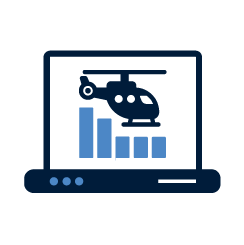 Cassiopée is a twofold offer that combines flight data management software packages and analysis solutions for all types of airplanes and helicopters. Our services enable fuel consumption reduction, maintenance costs optimization and flight safety enhancement. Our aim? Improve our clients’ operational efficiency by providing an array of services that allow a better understanding of performance of their aircraft and systems. Our objective? Allow you to use your data wisely, in order to facilitate decision making. But how do we get there? Before anything gets done, data needs to be collected. We process by retrieving all the information emitted by the aircraft in flight, whether they are specific to navigation, landing, engines, etc. Our Data management solutions helps you decode, cleanse and sort your flight data and allows you to combine external data (weather, flight plan, crew list, etc.) with your flight operational data in order to contextualize them and improve their readability. Our comprehensive Flight data analysis solutions provide reviews made by in-house experts which offer accurate and customizable information aiming to improve decision support. WOULD YOU LIKE TO TRY CASSIOPEE? For more information about Cassiopée, click here and one of our sales managers will get in touch with you.